Most of the apps (or applications) for Android-based devices is available for download through the central Android Market, which is installed by default on most Android smartphones and tablets. Unlike iPhone, as Android is an open system, there may be programs especially hacks that are not available from Android Market, and only can be downloaded from third-party sources. All installable Android apps are using the .apk file type format. A file with .apk extension is an Android Package file, and can be installed on any Android powered device. While Android Market can download and install the apps automatically, but how to install non-Market .apk apps onto Android? 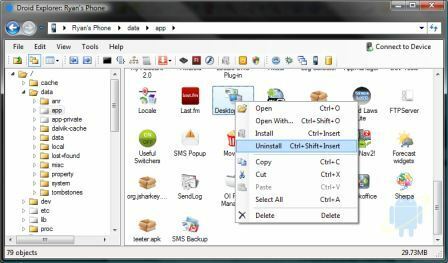 Unlike Windows, Mac OS X or Linux desktop operating system, where user can simply double click to run the installer, Android does not even include a File Manager in stock form. However, there are many ways in which an .apk can be installed onto the Android device, and here’s the trick and guide on how to install .apk apps. While Android Market app cannot install an .apk file directly, it can be used to download apps installers or APK installers that available for free download from Android Market. There are many apps that specializes in installing non-market apps. Search for applications named AppsInstaller, FastAppInstall, Installer, App Installer, Onymous App Installer, appInstaller, eoeAppInstaller, Fast Installer and etc, and download and install the app. Tip: There are also file manager or multi-purpose utility which includes ability to install APK file onto Android system. For example, ASTRO File Manager, Mobile Manager, AndroZip File Manager, AppToolkit, Android Mate, EStrongs File Explorer and etc. copy the .apk file to the root directory of the SD card. Most apps installer will automatically scan the root folder (or even entire content) of the SD card to look for any .apk files. Touch the Android APK app that wanted to be installed to initiate the installation. Once installation is completed, user can access the application from menu. By directing installing an app in .apk extension to the mobile device via computer, user does not need to use Android Market, and hence does not need to associate a Google Account with the Android device. Download and install Android SDK (available for Windows, Mac OS X and Linux) by simply unpacking the starter package to a safe location and then add the location to system’s environment path. For Windows users, download and install USB driver for adb by double clicking on SDK Setup.exe at the root of the SDK directory to invoke the Android SDK and AVD Manager. To launch the tool using the script, double-click SDK Setup.exe at the root of the the SDK directory. From the Available Packages panel, select Usb Driver Package. The setup installer of the USB driver are downloaded into the \usb_driver sub-directory inside the SDK folder, which can then be used to install the driver. Note that the official USB driver for Windows provides support for the following Android-powered devices: T-Mobile G1 / ADP1, T-Mobile myTouch 3G / Google Ion, Verizon Droid, Google Nexus One or similar hardware on other carriers. Any additional devices will require Windows drivers provided by the hardware manufacturer. Connect the Android phone or tablet device to the computer using USB sync cable. On the Android device, go to Settings -> Applications and in the “Application Settings”, enable (tick) Unknown sources. Optional (only if option available): Go to Settings -> SD card & phone storage and enable (tick) Disable Use for USB Storage. Enable again after installing the app. Copy the .apk Android setup package to a folder (preferably inside the Android SDK folder) on the local computer. Droid Explorer allows supported Android device to be remotely managed and controlled from computer. It includes features to copy local files to device and Package Manager to install and uninstall apps, with ability to right click on the APK file to install or uninstall. Download Droid Explorer from codeplex.com. Note: User still need to install proper USB driver for the device in order for Windows to recognize the device.